In a move likely to intrigue anyone who hears about it, the Perth Mint of Australia (www.perthmint.com.au) has unveiled an enormous 1 tonne Gold Kangaroo Coin. The Australian strike is touted by the Perth as the "biggest, heaviest, inherently the most valuable gold bullion coin in the world." The specifications of the new Gold Kangaroo back up the Perth Mint’s claim. The massive piece weighs in at approximately one ton which equates to 1,000 kilograms or 32,150.746 troy ounces. This coin’s diameter and thickness are also impressive coming in at nearly 80 centimeters and 12 centimeters, respectively. For comparison, the Perth’s immensely popular one ounce gold kangaroo coin has a diameter of 3.26 centimeters and a thickness of .28 centimeters. 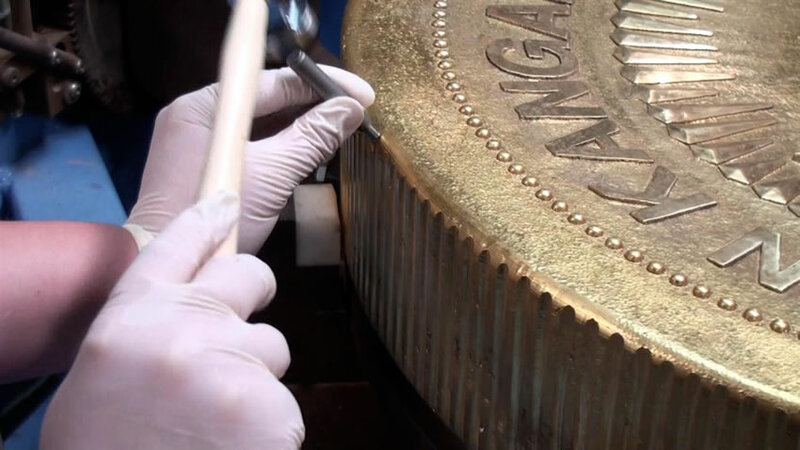 "To cast and handcraft a coin of this size and weight was an incredible challenge, one which few other mints would not even consider," commented Perth Mint’s Chief Executive Officer Ed Harbuz about the 1 tonne Gold Kangaroo Coin. Acknowledging the immense size and value of the 99.99% pure gold piece, it has been given a legal tender face value of AUS $1,000,000. Based on recent gold prices of over $1,725 an ounce, it has a melt value of over US $55.4 million. In keeping with the Perth’s Kangaroo bullion tradition, the reverse contains the classic kangaroo design by Dr. Stuart Devlin AO CMG, goldsmith and jeweler to Queen Elizabeth II, which is also featured on the 1 kilo size. Inscriptions around the marsupial include "RED KANGAROO," "AUSTRALIAN KANGAROO," "1 TONNE 9999 GOLD" and "2012." Additionally, the Perth Mint’s historic "P" mintmark may also be found on the reverse of the strike. Since the product was actually minted as legal tender, the obverse contains the Ian Rank-Broadley effigy of Her Majesty Queen Elizabeth II. Obverse inscriptions include "ELIZABETH II," "AUSTRALIA" and "1000000 DOLLARS." The creation of the 1 tonne Gold Kangaroo follows other massive world issues. In 2000, the Chinese Mint struck a 10-kilogram gold piece only to be outdone a few years later. In 2007, the Royal Canadian Mint issued a 100-kilogram gold coin. That strike, at the time, was listed by Guinness World Records as the largest in the world. Those looking for more information and images of the new 1 tonne Kangaroo piece may find it on the Perth Mint’s site created just for it — www.1tonnegoldcoin.com. Buyers can purchase coins from the 2012 Australian Kangaroo series or chose from the range of gold cast bars and silver bullion products at perthmintbullion.com. See other Perth Mint coin highlights from this site’s Australian Coin Guide. The Perth Mint (www.perthmint.com.au), wholly-owned by the State Government of Western Australia, is the official issuer of the Australian Federal Government’s Gold and Silver Bullion Coin Program. The Mint opened in 1899 in response to the discovery of rich gold deposits in Coolgardie and Kalgoorlie. It was Australia’s third branch of Britain’s Royal Mint. 1 tonne Gold Kangaroo Coin will be a tourist atraction at Perth Mint. Is this coin for sale? 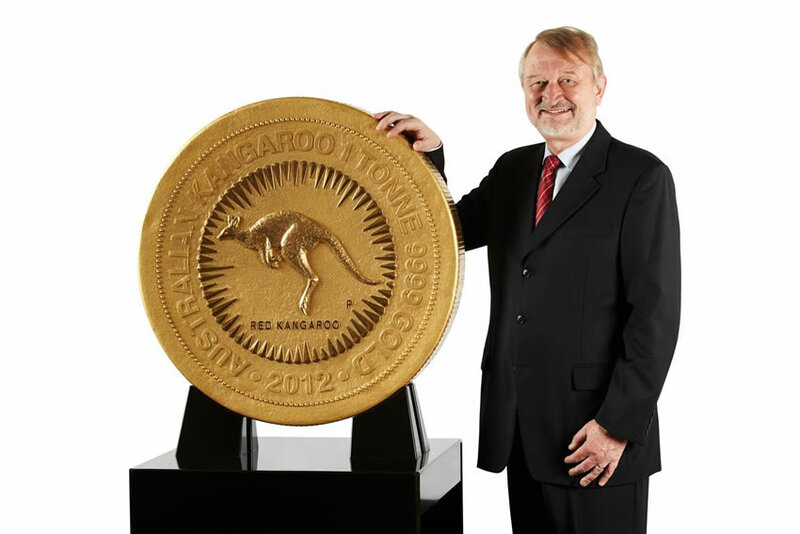 So what is a bullion price and market price for this 1000 kilogram 2012 Gold Kangaroo Coin? Do you think Australian really happy to see the Elizabeth’s portrait on the half of the coin? I mean, look, we live in time that people are more important than kings, queens, royals, Arab sheikhs or great ayatollahs. Even as a symbol it is meaningless and unacceptable to give such a importance to one person or family. Consider the fact that Steve Jobs was ten times popular than any king or queen but putting his portrait on such a coin would be interpreted as egoism and narcissism. Perth Mint has create a new history. Let just wait what will the weight be next for the world biggest gold coin. The kilo’s races are over.